If you are a frequent reader here, you know that I LOVE Gooseberry Patch Cookbooks. I love them so much that I'm a Early Cookbook Reviewer for their Company! Those sweet ladies send me cookbooks to review, blog and even giveaway copies! As you know I have a giveaway going on right now, 101 Hearty Recipes(click to enter) and it ends on 8/26. I have shared several recipes from this book and will post more soon. I've made at least 5 things in this book over the past month. It isn't too late to enter. Hope over and do it before 8/27. Soooo on to the new book, Big Book of Home Cooking which to say the least is BIG! I thought big would be 200 pages but no this book really is BIG. It has over 350 pages, hard back and beautiful, mouth-watering photos. I don't know about you but whenever I get a new Gooseberry Patch Cookbook I always sit down in a comfy chair armed with a package of post-it note tabs. I start tabbing items that I must try first. 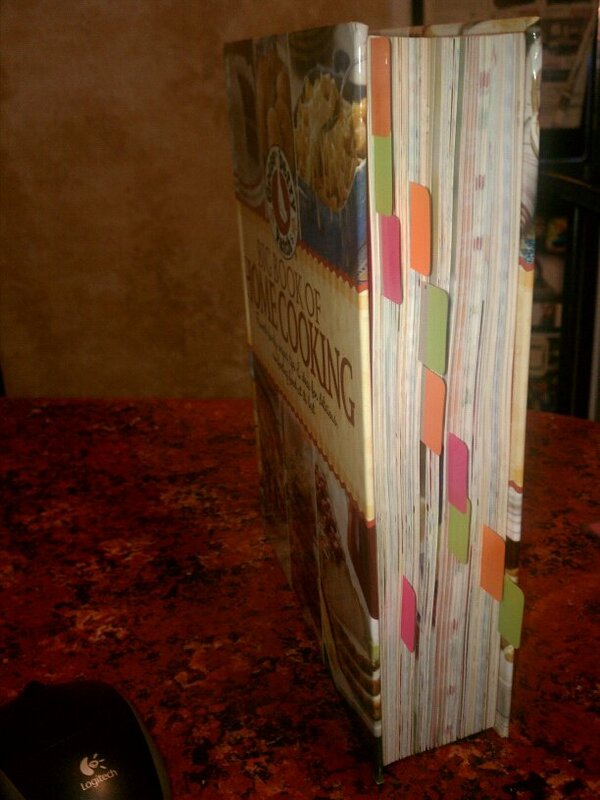 This book, as you can see by the tabs, is so full of recipes I had to restrain myself from marking every other page. I had to remove some of the tabs to narrow down what I planned on cooking first. Here are a few of the recipes that I will be trying out, sharing pictures, the recipes as well as offering a copy of this BIG book as a giveaway. It was NOT easy to narrow down which recipes to make first. The ones picked are perfect for my up and coming meal plans and events. There are plenty more to come. 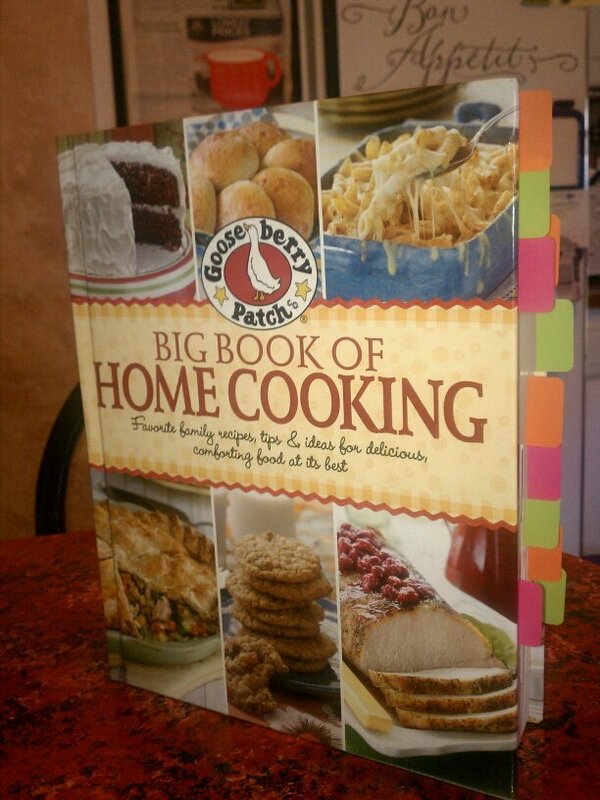 What is your favorite Gooseberry Patch Cookbook or recipe?If you are NOT familiar with Gooseberry Patch, visit them HERE, and find a book or a recipe that is one you want to cook. Leave a comment below and you will be qualified for 5 bonus entries into this giveaway when I post it on Saturday September 3rd, 2011. This book isn't for sale until Sept. 20th and is being published by Oxmoor House. Click HERE to see the Amazon info. I'm an early Gooseberry Patch Reviewer. A cookbook was provided to me in exchange for my honest opinion. I like the 101 Homestyle Favorites Cookbook. I love to cook and always enjoy a new cookbook. To me it's almost the same as reading a novel ! And I love plain old home cooking so the recipes from Gooseberry Patch sure do fit the bill !! Oh this big ol book is beautiful!!! I can't wait to look through it. I just love everything Gooseberry Patch! sounds delicious. I also love home cooking! I LOVE gooseberry patch cookbooks! This would make a great addition to my collection! I can't say which would be my favorite - I have so many! Wow, I have so many favorites. I have collected sine GBP's beginning. I have over 40 books in my colection, plus numerous bookazines. Some of the ones I go to the most are Comfort & Joy, A Pinch of This A Dash of That, Gifts for Giving, More Gifts for Giving, Good For You, Christmas Pantry, Country Quick & Easy, Ready Set Eat. I could go on and on. I would LOVE to win this new Big Book of Home Cooking!!! How does one choose just one?!? I love them all, though I'm particularly fond of the slowcooker meals seeing as the cooler weather is coming. Thanx again for hosting such a wonderful giveaway!!! Gooseberry Patch = love at first sight. They are all winners! Thanks! I just LOOOOVE Goose Berry Patch cookbooks. I hope I WIN!!!!!!! I like their Quick & Easy Christmas Cookbook -! I just received the new Quick & Easy Christmas and it is fast becoming my favorite! Love the Gooseberry cookbooks, and would love to add this to my collection! I dont have any of their cookbooks but have been eyeing them up for some time. I would love to make the fried dill pickle recipe. My 3 year old loves pickles so it would be perfect for him. I see some christmas presents I am going to be giving!!!!!!!! This BIG ole book is AWESOME! Thanks for the extra 10 points! I'm intrigued by the Gazpacho Dip! I really want to win this book. I'll be here on opening day to enter! I love the GBP crock pot cookbooks! I love to cook and try out new recipes and I LOVE Gooseberry Patch recipes!! amazing! this cookbook will be very useful for me! since i a 'novice' cooker. rofl. I love ALL Gooseberry Patch Cookbooks. I love to make cookies so I'd probably pick GBP Christmas Cookies. But I love all the others too & would especially love to win this one! I also love Gooseberry Patch Cookbooks. They are wholesome just the way my family likes it! I LOVE Gooseberry Patch and just discovered your site today. It's great and I look forward to visiting it on a regular basis! Love Gooseberry Patch, I have pantry shelves lined with cookbook after cookbook of theirs. I love the Gooseberry Patch Baking Cookbooks. 101 Cupcake, Cookie & Brownie Recipes is a really great one! Hi :) I absolutely love to cook and my favorite cookbooks are Gooseberry! I am def looking forward to this cookbook! I love, love, love, GBP. I think my favorite cookbook is Farmhouse Kitchen. I love Gooseberry cookbooks. I would love to win one. Thanks for having such a great giveaway. I love all their recipes and cookbooks, but especially love the slow-cooker and "quick and easy" ones. I love to cook, but don't want to spend forever in the kitchen! You can't go wrong with a Gooseberry Patch recipe! Thanks for the chance to win! My favorite that I own is Made From Scratch, but I have loved their Christmas books for years and years. Love their recipes. I want to make the maple popcorn balls! 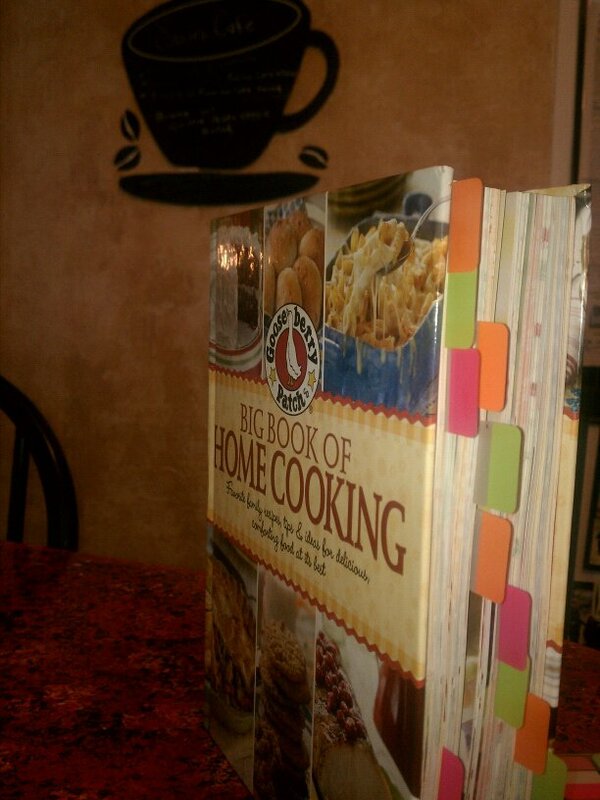 And I would LoVe to win the Big Book of Home Cooking!! Thanks for the chances! I love the Gooseberry Patch Christmas Cookbook . Great giveaway! I have been a fan of Gooseberry Patch for years! I used to love their catalogs, and of course have many cookbooks. I recently got one of my recipes accepted into a cookbook coming out next year! Thanks for this wonderful giveaway! I love Gooseberry Patch and hope to have ALL of their books. I love that they have recipes submitted by moms & dads of families that are sharing their family recipes. LOVE Gooseberry cookbooks! !Thx for the opp!! This book looks wonderful! I love Gooseberry Patch books because they offer "real" recipes for "real" people. Can't wait until you try the fried okra salad, can't beat fried okra! Yum! Comfort and Joy is my christmas season bible. One of the recipes featured in this book that I make all year around are the puffy marshmellow cutouts..YUMMY! WOW to pick one would be incredibly hard, because I love them all. The one cookbook I go to the most is 5 ingredients or less. Wow, what a book. This has to be the king of all cookbooks! The recipes in Gooseberry Patch cookbooks are always good! My local Lowes store has the new BIG GP cookbook now. I saw it the other day and thought it would make a great gift at Christmas or for a new bride (as well as for me!). There are NO better cookbooks than Gooseberry Patch! Hi. It is so cool that you're doing this giveaway. I love Gooseberry Patch books and would love to win one! Love anything Gooseberry!!!! Love the colored side tabs--looks like it would have tons of recipes my family would love! I have 2 favorites in the older Gooseberry Patch cookbooks---MOMS FAVORITE RECIPES---FROM GRANDMAS KITCHEN...I would love a few of the newer books and this one seems really special. Love to read them and mark then cook...mmmmgood! Me,Me,Me I love Gooseberry Patch cookbooks and a big big version...swoon! I have many cookbooks and i love each and everyone, they all have their own special personallity that attracted me to them, i just resently got my first gooseberry cookbook, ive been drooling every sence, this cookbook would be devine to add to my collection!! So pick me, pick me, please!!!! Can't pick just one favorite cookbook I have favorite recipes in each and every book that I have! Would enjoy adding this one to the cookbook collection! Love Gooseberry and love, love, love a new cookbook! I love Gooseberry cookbooks! I can't wait to get a look through this one! I love Gooseberry Patch-when I saw the new cookbook, I knew I neeeded to check it out. As a mom of a toodler, I love to teach her how to cook and bake-this cookbook would be a great addition to our traditions. I am very intrigued by the Fried Okra Salad! Yay! Thanks all for stopping in. I'm trying to give you all a visit. I'f you have a blog I've visited up to #10. I would love to win a cook book, I just had a birthday last week and a nice cook book to help the blues would help. LOVE THE WEBSIGHT. Thanks for all who stopped in. Just a reminder that the actual giveaway will begin on Sept. 3rd on a brand new post. Everyone who left a comment here will get 5 bonus points/entries when the giveaway opens! I'll have a spot where you can claim your entries! Thanks all. If you have a blog, I stopped in, followed you and left a comment. I love Gooseberry Patch Cookbooks!! I don't have any Gooseberry Patch books, but I'm familiar with them. I would love to check out *101 Slow Cooker Recipes*! I have quick and east Autumn cookbook and love it. Some many recipes so little time....ill make time!!! I would love this book! My favorite GP cookbook is called Fabulous Fall. There are several recipes in there that I start making religiously once Labor Day hits! My fav Gooseberry Patch book is a free one that I received in the mail a long time ago with fall recipes in it. Thanks for the opportunity to win the cookbook!